Electric motorcycles have come a long way in a few years years and Zero Motorcycles has made them easy, affordable and simple. This year, they double up to impress us further. Zero Motorcycles has diversified its electric motorcycle nicely over the last few years while steadily perfecting them. The little dirt bike we once knew in 2009 has morphed into a street bike and other sportier versions. This year promises more horsepower, faster charging and most importantly, better range. Technically Speaking. They just announced today their 2013 model line boost an average power increase of 99% and hailed as the world’s longest-range production electric motorcycle. The Zero S packs 137 miles in average city drive and uses the company’s revolutionary new Z-Force™ motor. The new Z-Force motor and powertrain is air-cooled. 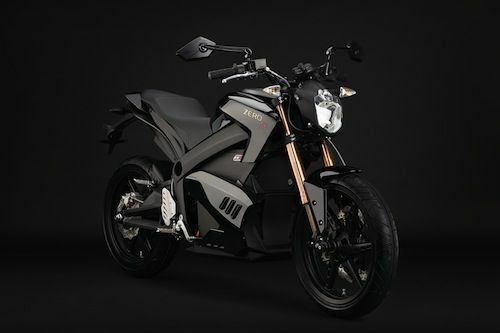 This is where Zero Motorcycles show the most promise with this efficient, passively air-cooled and compact electric motor. It now finds its way into every 2013 motorcycle and operates using a new higher voltage Z-Force power pack. Faster Charging. To nip things in the bud somewhat, riders will have the option to charge faster than ever, using the CHAdeMO standard which gives you a 95% in less than an hour. Perhaps most exciting, Zero plans to begin initial deliveries of its complete 2013 model line to North America in January 2013. Zero Motorcycles 2012, Newer, Better. Almost everything in every motorcycles has been refined in order to implement the newer technology the company has. A smart mobile phone integration helps you tweak the motorcycles and leave your phone perfectly under your eyes using Bluetooth, riders can sync their iPhone or Android mobile phones to see detailed motorcycle information. They can even adjust performance characteristics. Modular Design. Basing its philosophy on sophisticated simplicity for 2013, Zero Motorcycles maximize the feel of the ride. With instant torque, a nearly silent belt-driven system and no shifting, riders need only focus on enjoying the ride. One thing that makes the Zero Motorcycles intelligent is a surprisingly well thought hot swappable battery blocks. The Zero FX, the Zero XU and Zero MX have neatly integrated storage in the ”tank” area allows up to two battery. Best yet, the controller can adapt to use the one with more charge so that you could ride with a depleted battery using the other. According to Richard Walker, CEO of Zero Motorcycles: "With up to 137 miles range in the city, a top speed of 95 mph and a CHAdeMO accessory that allows recharging in around an hour, the 2013 model line is truly exceptional. This year's lineup offers breathtaking acceleration, new eye-catching designs and the innovative ability to customize the riding experience to each individual's preferences via a mobile application. We invite consumers to discover the experience of riding a 2013 model by contacting an authorized dealer to sign up for a test ride or to place an order. The new lineup arrives in January." A Motorcycle For Almost Anyone. For 2013, Zero Motorcycles introduces the Zero FX as the ultimate “do anything” and “ride anywhere” urban bike. It is the fastest accelerating motorcycle in the company's lineup with 70 ft-lbs of torque, 44 hp and a low weight of only 275 lbs. The, now features the world's first truly modular quick-swap power pack technology. Riders can now use one or two battery modules and can upgrade any of the previously mentioned models from 2.8 kWh to 5.7 kWh in seconds. With increased range, vastly improved handling and impressive power, the now full-sized Zero MX is capable of comfortably launching off significantly larger jumps at the motocross track. Price Wise. Zero Motorcycles may qualify to receive government rebates or credits and are sold through authorized dealerships. They are street-legal and come with a two year limited warranty, while the Zero MX comes with a one year limited warranty. The Zero S will set back $13,995. The Zero $13,995. The Zero FX $9,495, the Zero XU $7,995, while the Zero MX $9,495. Seeing riders come up to the stand is probably the best way to gauge interest in electric motorcycle. If my brief and informal talks with them is anything to judge, they have come far in a few years. Riders are a passionate bunch, they get it, at least the first time they jump on one. In fact stay tune for what happened next when a Long Beach motorcycle police officer actually drove the “police” version we had on the street. In the meantime Zero Motorcycles continues to refine its electric motorcycle and this year’s new electric motor and added range should please a few. I Really like my 2012 DS... The 2013's are spectacular! Yeah, it really made me want to try it out. I'm going to write a story on how a police officer drove it, first time on an electric motorcycle and liked it a lot. Talk about the ultimate paradigm shift. I have 2 electric recumbent bikes that I use for 90% of all my trips. While electric cars are great, electric bikes/scooters/motorcycles (any of them) are greater as they are much lighter (less energy use), easier to maneuver, easier to park, much cheaper to run, not as complicated and electronics intensive as a car, meaning less maintainence cost and time. Use the e-bike as much as possible, and the car only when absolutely necessary!!! Nick, an E-bike is >10 times more efficient total energy wise than a pedal bike (Well to wheels)!! I also have the "Pedal Advantage", I can pedal for exercise or if the E-drive goes down, or to pedal with it, and you don't need license, insurance or plates!! It costs me 12 cents for a full charge (30 > 40 miles) I have been riding for over 60 years, and I have a rear view mirror on my riding glasses (best place, does not get out of adjustment if you change your position) to watch behind me, and very good lighting front and back for night. I agree Franck, I'm looking into fitting a small pack on my Trek to just help me those days I don't feel like wearing myself out. I'm not about your math since most of these e-bike kits are made in countries that have shoddy pollution controls. Not that we're anything to look at either :) I agree about the rear view mirrors on a helmet, it makes more sense than on handlebars.